Emergency water supply tablets for survival! Thirsty, but not that thirsty? Well, when you're faced with the prospect of drinking water of questionable microbiological quality, turn to these Tablets. When used as directed, the Tablets make contaminated water suitable to drink. 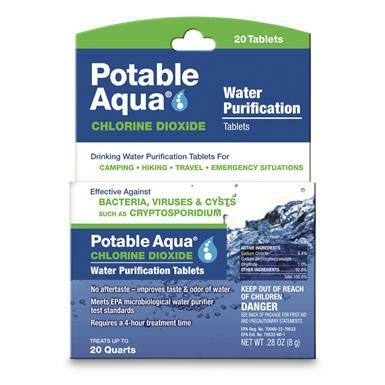 Chlorine Dioxide is proven against viruses, bacteria and cysts including giardia lamblia and cryptosporidium. Meets EPA microbiological purifier standards. The tablets not only make water safe to drink, but improves taste and odor, making them a great choice for camping, international travel and emergency situations. Work great with hydration packs and a 4-hr. treatment time is required for effectiveness. 1 tablet treats 1 qt. water. Please Note: Tablets come in a box NOT in a bottle as shown. Measures just 4" x 4"
You provide the buckets, and this provides drinkable water!